[Update: 2012-12-12 – You might want to check this App out if you are having the issues with TuneIn! Improved podcast playback performance, enhanced content organization and display in browse categories, and resolved several application crash conditions. So, go get it, and come back to let me know how it is performing for you. 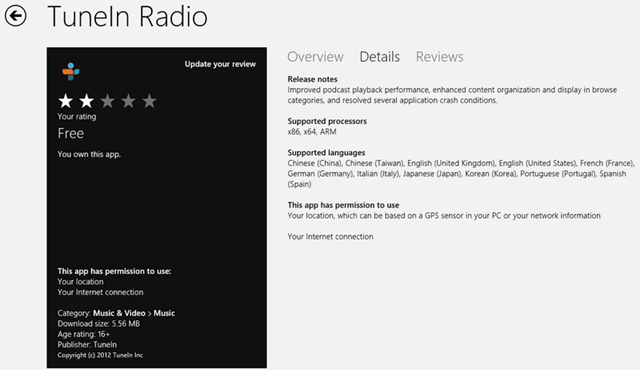 The embattled Internet Radio application Tune-In has released a second update in the store since yesterday. One emergency update was released yesterday evening, and one this afternoon. Unfortunately I have to inform you that both updates did not resolve the current issue with the App. The App installs normally on first use, but after initial use, possibly the second day, it only shows blank black screen. You can attempt to resolve by uninstalling and re-installing as much as you want, it wouldn’t solve the problem. Many users of Tune-In, including yours truly, has complained on the review page of this issue. 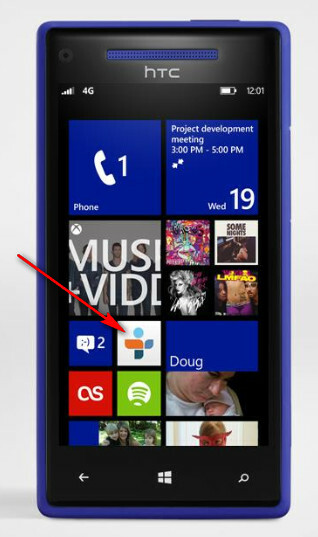 Even I personally reported it to Microsoft as a failed app. Its either removed from store till the vendor can fix it, or they release an update to patch. Obvious attempt to patch is not working right now. I fear the App may have to be removed. The updates are now rolling out, so check a few times if you don’t see it. Let me know if it fixed the problem for you. Thanks to Gutty information in the comments here below, I have confirmed that the Tune-In App has been pulled from the Store as of today. Hopefully this as a result of users complaints and Microsoft involvement to get this troubled app fixed before the RTM. I will keep monitoring the Store and inform you of any updates in the future. [Update: 2012-09-10] Its post RTM and Tune-In is still missing in the Store. I have reached out to Tune-In and solicit a response, but they are keeping mum on what exactly is the issues they are having the App. Given the number of people coming to this site on Status, I can tell you the app is really a big deal and Tune-In should step up and come clean on exactly what the problem is. I have recently been entertaining another thought on this all. 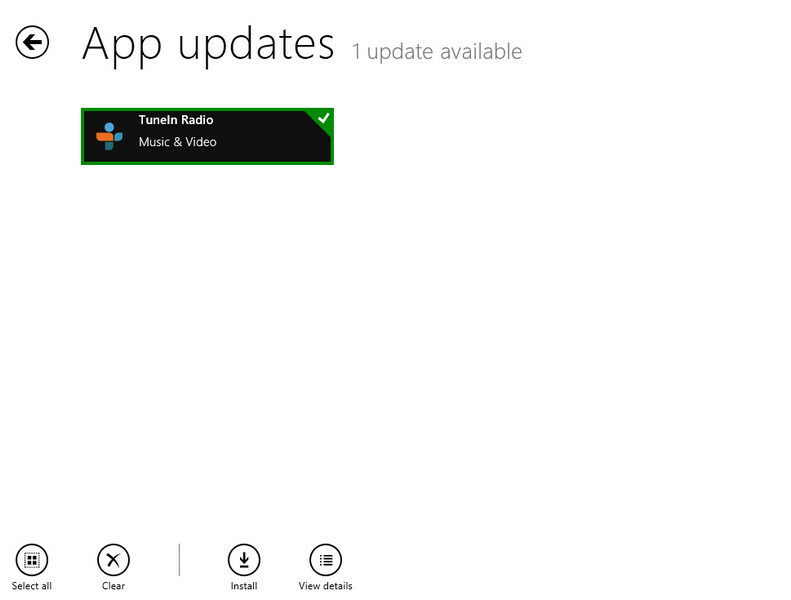 I think Tune-In and Microsoft have fixed the problem, but decided to hold unto the app till GA end of October. Either way, I think its bad habit of Tune-In to keep its users in limbo state like this. Yes, you are right, TuneIn have been pulled from the store. Hopefully they’ll be able to fix the problem before it returns to the store again. I will update the post to reflect this information. For those of you coming here for Tune-In news, I am afraid it is still bad news on that front. Tune-In remains missing in the Store up-to and since RTM. God knows what they’ve got that is so bad that they are taking literarily months to fix it. Keep, checking back, I’ll update the post as soon as they are back. Please see my update in the Post. Its either still bad news for Tune-In pre and post RTM or they’ve fixed the problem and Microsoft and Tune-In is holding onto it till GA in October. I have reached out to Tune-In personally on this, but didn’t receive any response. Lets hope for the better in October. I cannot get it to work at all in my windows 8. I tried about 25 different stations and will not play any of them. Have uninstalled and reinstalled. Is there a way to manually install updates that my be available. First, my apologies for the late response, got caught up with work. Unfortunately, there is no way to apply updates to this app other than through the Store. It has to do with Application Certificates. My advice then to you is to fully uninstall Tune-In, set your computer Locale and language to US, re-install and see if this helps. You can then set your locale back to the original setting. Keep me updated with your progress.